Three years ago, Ke Gao stood uncomfortably beside rows of biomedical students and plant scientists at the Bond Life Sciences research fair. His poster wasn’t discussing the DNA of seeds or how plants transport nutrients but rather a scientific device. “At the beginning, the visitors didn’t understand what we were presenting, but once I explained how our application can help them accelerate their research and how we can really turn their phones into a research device, they got really excited,” Gao explained. Gao’s presentation highlighted a mobile app that transforms images of seeds into objective, quantitative data. It started with a simple problem. Plant scientists were manually comparing hundreds and in some cases thousands, of seed photos. The process was meticulous, slow and subjective. 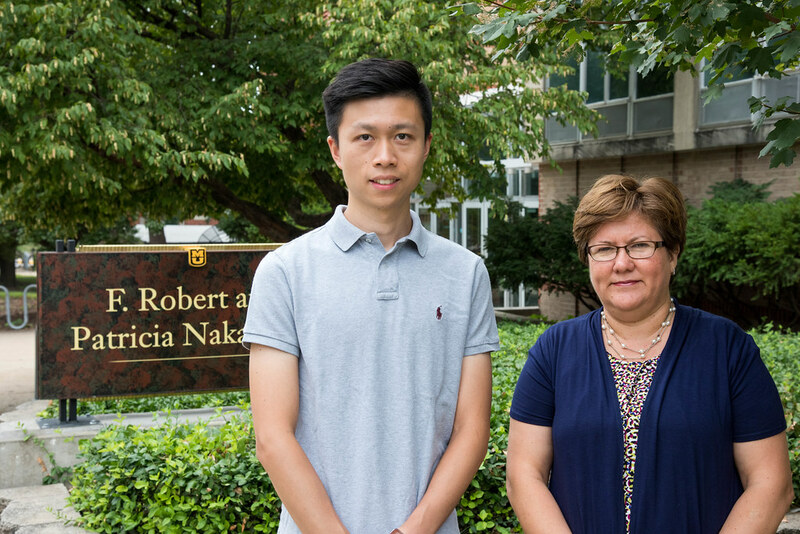 The solution began with a collaboration with Michele Warmund (Plant Sciences), Tommi White (MU Electron Microscopy Core) and Filiz Bunyak (Computer Science) that led to a MU Interdisciplinary Innovations Fund grant. Gao was part of this team that developed an algorithm to turn the photos of seeds from the field into data with the touch of the button. Gao explained the app is very similar to Instagram. A user takes or uploads photos of seeds. Then the app calculates measurements describing shape, color and size characteristics of the seeds. This data can be emailed or stored in a database. Some experiments need thousands of seeds analyzed; this would be a massive feat for even a group of students. With this app, hundreds of seeds can be photographed and measured from a single photo. The app analyzes each seed individually and also computes measurement averages for groups of seeds. There are other apps that analyze seeds, but this is the first mobile application as far as the team knows. Its ability to analyze multiple seeds at once, even if they are touching is also an outstanding ability. Bunyak’s previous experience developing applications to quantify microscopy images and videos of touching and clumping cells helped them design the algorithm to make that function possible. This isn’t just a problem for researchers in this one lab or even at the University of Missouri. MU Computer Science professor, Filiz Bunyak, said noninvasive methods to observe and understand biology, imaging equipment and corresponding computing devices have advanced considerably in recent years, leading scientists to produce large amounts of data. The ability for researchers to analyze and quantify this large amount of complex and unstructured data, however, was still missing. Bunyak said this app began as a project to advance scientists’ capabilities to automatically analyze image-based plant phenotyping. Bunyak and her students are advancing the field of high-throughput phenotyping beyond this mobile app. High-throughput phenotyping (HTP) refers to the process of connecting an organism’s DNA makeup to its physical characteristics; it is also a hot topic buzzing through the science community in the last five years. Two years ago, Bond LSC scientist David Mendoza, who studies how plants collect nutrients, said he never imagined he would be doing HTP. “The old way of doing this is growing plants on plates and, I’m not kidding, with a ruler you measure how long the roots are,” Mendoza explained of the traditional process that now seems archaic. Now, the lab is working with computer scientists to design a robot to code the measurements for multiple roots at a single time. For a student, it would take 15 minutes, but now it’s complete in an instant. Speed isn’t the only reward researchers are reaping. Bunyak said computational image analysis allows researchers to come up with new ways to quantify and study data that they were not even able to do before, leading to the design of novel experimental methods. Ruthie Angelovici is another Bond LSC researcher who uses computer scientists to aid in her research. She said without computer imaging there would be no way for her team to do research that measures plants physical and biochemical traits. Angelovici’s lab uses Bunyak’s mobile app system but on a computer. Eight plants are photographed at once and the application keeps track of features of plants such as shape, color and area as they develop. What is really revolutionary to Angelovici is the ability for the data of plant growth parameters to be stored and revisited without the need to re-grow. This contrasts with past experiments where researchers would scribble some notes and never be able to return. “It’s not lost and I think that’s a big step in this field,” Angelovici said. The collaboration is creating more than advanced tools by fostering a new way to think and approach research. Rather than buying pre-existing software, the groups from Bond LSC utilizes the resources on campus to build their own devices. Mendoza’s team publishes all the instruction to its robot online, so the technology can aid other labs in making faster discoveries at a lower price. Angelovici compared it to buying a cake versus making a cake — at the end of the creation process, she said she would have the knowledge to do a lot of other experiments. This new way of thinking already began to pay off this summer when her lab expanded computer software to analyze seed size. “We only approached it because we saw how things worked together. I just pitched a project to engineering about seed collector. Again, this opened my eyes that even undergraduates can do something not so difficult for engineers, but I have no clue how to do it,” Angelovici said. Both teams continue to work towards maximizing the functions of their individual machines, but even after the projects reach fruition the collaboration will not be over. “On the contrary, I think we’re going to keep building more and more and better,” Mendoza said. Nowadays, Gao no longer feels out of place at the Life Sciences fairs. Researchers from various labs come up to him and ask how they can implement his app in their own lab. “It seems like I’m doing something that can really help people, so that’s the best part of this process,” he said. Ruthie Angelovici is an assistant professor in the Division of Biological Sciences and is a researcher at Bond Life Sciences Center. She received her degrees in plant science from institutions in Israel — her B.S. and M.S. from Tel Aviv University, and her Ph.D. from the Weizmann Institute of Science in Rehovot. She was a postdoctoral fellow at the Weizmann Institute and at Michigan State University and has been at MU since fall of 2015. David Mendoza is an associate professor in Plant Sciences, Life Sciences Center investigator and a member of the Interdisciplinary Plant Group. His research focuses on the mechanisms plants use to resist toxic elements or acquire nutrients. He received his Ph.D. in biochemistry from UNAM in Mexico City and continued on to do post-doc training at UC San Diego. Filiz Bunyak is an assistant research professor in the Department of Computer Science. She received her bachelors and masters degree from Istanbul Technical University and her Ph.D. from the University of Missouri- Rolla. Her work focuses on computer imaging, image processing, and biomedical image analysis. Ke Gao is a doctoral student in the University of Missouri’s Department of Electrical Engineering and Computer Science. He earned his bachelor’s of science from the Henan University of Science and Technology in China.